Amazon.com Price: $595.05 (as of 22/04/2019 09:20 PST- Details) & FREE Shipping. 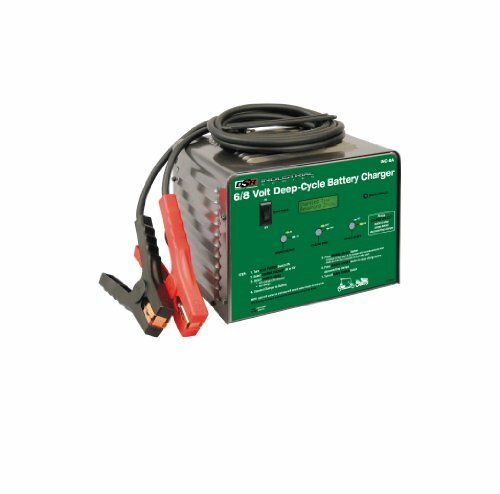 Schumacher’s Industrial battery charger charges 6 Volt and 8 Volt batteries, with two distinct charging modes: fast charge and full charge, for deep-cycle batteries. Features large, easy to read LCD display with a countdown timer to show the time of charge remaining, charger mode selections and the battery voltage upon start-up, as well as a “charge complete” audio alarm and LED notification light. Replaceable, heavy duty cables are over 7 feet in length and 4GA ultra-flexible welding quality, with a 125 ampere polarized quick-connect connector. Also includes an all metal case with a powder coated finish for superior durability and patent pending thermal runaway protection, which stops charging if the charger detects a problem with the battery.